Draft: 1997, Toronto Blue Jays, 43rd rd. December 13, 2013 2B Orlando Hudson assigned to Venados de Mazatlan. 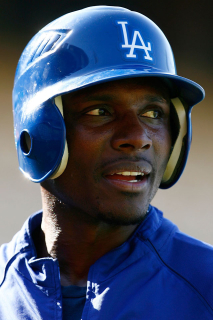 November 22, 2013 2B Orlando Hudson assigned to Toros del Este. November 3, 2012 3B Orlando Hudson elected free agency. September 1, 2012 Chicago White Sox activated 3B Orlando Hudson from the 15-day disabled list. August 27, 2012 sent 3B Orlando Hudson on a rehab assignment to Charlotte Knights. August 17, 2012 Chicago White Sox placed 3B Orlando Hudson on the 15-day disabled list retroactive to August 16, 2012. Left foot contusion. May 22, 2012 Chicago White Sox signed free agent 3B Orlando Hudson. May 17, 2012 San Diego Padres released 2B Orlando Hudson. June 19, 2011 San Diego Padres activated 2B Orlando Hudson from the 15-day disabled list. June 15, 2011 sent 2B Orlando Hudson on a rehab assignment to Lake Elsinore Storm. May 27, 2011 San Diego Padres placed 2B Orlando Hudson on the 15-day disabled list retroactive to May 26, 2011. Left groin strain. May 19, 2011 San Diego Padres activated 2B Orlando Hudson from the 15-day disabled list. May 18, 2011 sent 2B Orlando Hudson on a rehab assignment to Lake Elsinore Storm. May 15, 2011 sent 2B Orlando Hudson on a rehab assignment to Tucson Padres. May 4, 2011 San Diego Padres placed 2B Orlando Hudson on the 15-day disabled list. Right hamstring strain. December 20, 2010 San Diego Padres signed free agent 2B Orlando Hudson. November 7, 2010 2B Orlando Hudson elected free agency. August 8, 2010 Minnesota Twins activated 2B Orlando Hudson from the 15-day disabled list. June 18, 2010 Minnesota Twins activated 2B Orlando Hudson from the 15-day disabled list. February 4, 2010 Minnesota Twins signed free agent 2B Orlando Hudson. November 5, 2009 2B Orlando Hudson elected free agency.